Vitamins in the Air, absorb more with Teviron. : Can someone recovers from stroke? Can someone recovers from stroke? There were some postings that I had posted regarding Stroke, and I happened to have 2 more new testimonials and thought I should share it with everyone. Her name is Wu Heng Feng, she used to have poor health with insomnia and constant body soreness, but it was after wearing the nefful full set for over 3 months, she managed to loose 9kgs and had her poor health improved. Because of her faith in Nefful, she let her dad who suffered from stroke to use the full set as well, and now his state of health is back to normal. Do you know anyone with Aneurysmal Subarachnoid Hemorrhage or so called Hemorrhage Stroke? The above is the heart felt sharing of Wan-Shin Lien, I felt touched after reading her sharing and thought I should share it on my blog. 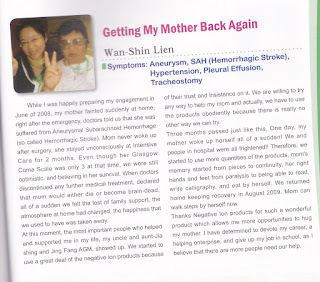 "....While I was happily preparing my engagement in June of 2008, my mother fainted suddenly at home, right after the emergency, doctors told us that she was suffering from Aneurysms Sub arachnoid Hemorrhage (So called Hemorrhage Stroke). 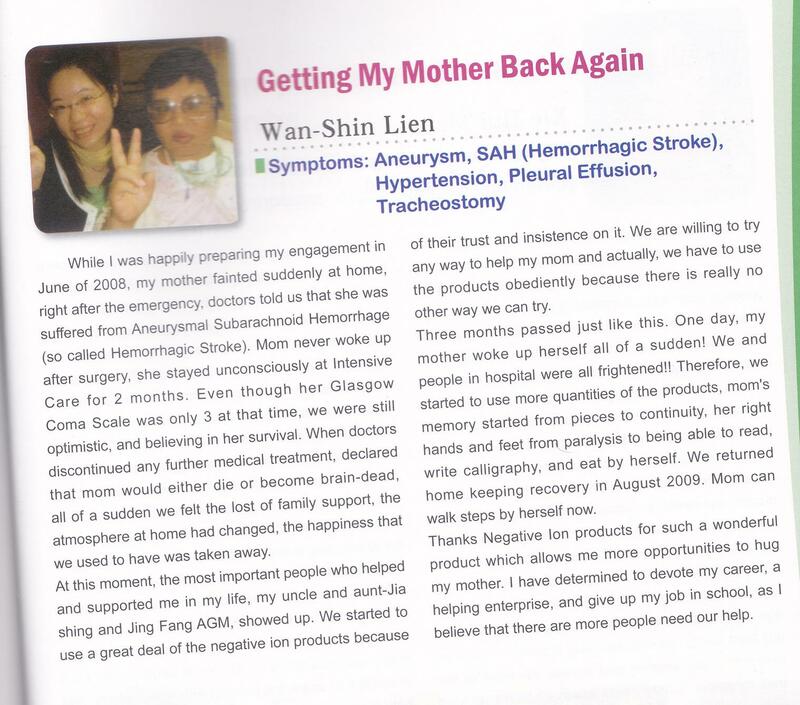 Mom never woke up after surgery, she stayed unconsciously at Intensive Care for 2 months. Even though her Glasgow coma scale was only 3 at that time, we were still optimistic, and believing in her survival. When doctors discontinued any further medical treatment, declared that mom would either die or become brain-dead, all of a sudden we felt the lost of family support, the atmosphere at home had changed, the happiness that we used to have was taken away. At this moment, the most important people who helped and supported me in my life, my uncle and aunt Jia-shing and Jing Fang AGM, showed up. We started to use a great deal of the negative ion products because of their trust and insistence on it. We are willing to try any way to help my mom and actually, we have to use the products obediently because there is really no other way we can try. Three months passed just like that. One day, my mom woke up herself all of a sudden! We and people at the hospital were all Surprised!! Therefore, we started to use more quantities of the products. Mom's memory started from pieces to continuity, her right hands and feed from paralysis to being able to read, write calligraphy, and able to feed herself. We returned home keeping recovery in August 2009. Mom can walk steps by herself now. 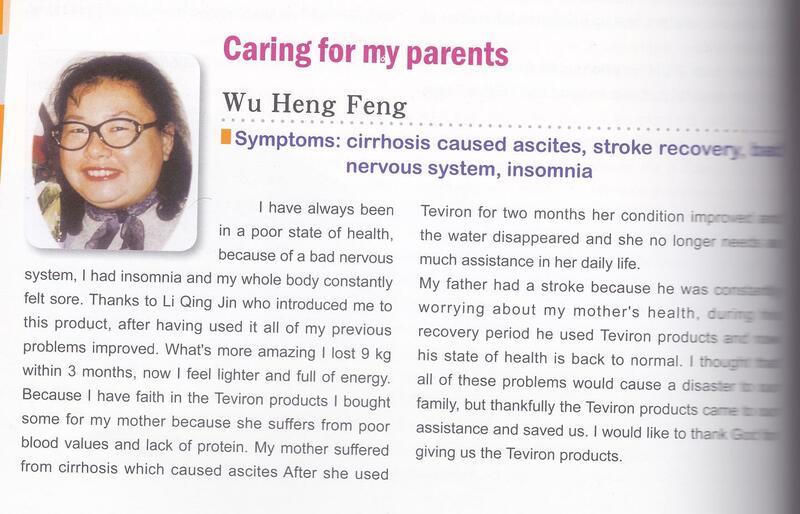 Thank you Negative ion products for such a wonderful product which allows me more opportunities to hug my mom. I have determined to devote my career, a helping enterprise, and give up my job in school, as I believe that there are more people need our help." Do Share this with whom might benefit from this, it could help them like Wan-Shin Lien's mother, it it is free to share good news, just like a good restaurant or good movies, you would share it with your friends and relatives even though you are not paid to do so.